Johann TetzelFeb. 6, 2019 (EcoSophia.net) -- Bloggers may take a month off now and then, but the world has a less flexible work schedule, and keeps on churning out days and weeks at the same unremitting pace. The last month was no exception to that rule, and it so happens that the days and weeks in question were unusually well supplied with raw material for this blog’s project. It was enticing to watch, for example, as Britain and the United States plunged into neck-and-neck competition over who could manage the most impressive state of total political gridlock. It’s worth noting, too, that what brought both governments to a standstill were disputes about national borders. That’s not at all surprising -- the great struggles of the era ahead of us will pit populists who identify with their nations against elites that identify only with their class -- but it’s a sign of the shape of things to come that the same conflict is building up so clearly at the same time on both sides of the Atlantic. Then there’s the petulant tantrum among Democrats triggered by Starbucks billionaire Howard Schultz’s announcement that he’s running for U.S. president in 2020 on an independent ticket. I confess that until his announcement, I’d underestimated Schultz; among Seattle’s swaggering nouveaux-riches magnates, he’d always struck me as the dull one. Yet Schultz seems to be nearly the only figure in U.S. public life who got the core lesson of the 2016 election, which is that a very large number of American voters will cast their ballots for anyone, absolutely anyone, who opposes the senile bipartisan oligarchy still clinging to power in Washington DC. There are thus good reasons for the Democratic meltdown. As the conservative party in U.S. politics these days -- the party, that is, that supports the preservation of business as usual, which is after all what the word “conservative” used to mean -- all they’re willing to offer the voters is yet another helping of the same failed policies that made Donald Trump inevitable. Their sole shot at victory in the 2020 election, as a result, is to present whatever hack politician their nomination process coughs up as the only alternative to four more years of MAGA, and hope that the voters will hold their noses and cast their ballots for the donkey they know. That, in turn, is what Schultz threatens to take from them. So far, he seems to be positioning himself squarely in the abandoned center of U.S. politics. If he can stay there, presenting himself as the sane alternative to the extremists on both sides of the aisle, his chances are by no means negligible. The best evidence for that, of course, is the way that the mainstream U.S. media is so loudly insisting on the opposite. That the mainstream media said exactly the same thing about Trump in 2015 and 2016 is indicative. Now as then, it’s precisely because the U.S. political class is scared pea-green that an outsider might win that their shills in the mass media are proclaiming to the skies in four-part harmony that he doesn’t have a chance. There are plenty of news stories along the same lines, to be sure, but what struck me as the most significant omen of oncoming change is something that got much less attention: the first media stories I’ve seen criticizing billionaire environmentalists for lifestyles that make a mockery of the ecological values they claim to hold. The sort of straining at cheeseburgers and swallowing private jets is almost universal on the allegedly progressive end of modern plutocracy. It came as no surprise that the Guardian, which these days is basically the house journal of the privileged faux-environmentalist set, responded indirectly to criticism of Stordalen’s lifestyle with an article asking, “Well, what should environmentalists eat?” -- as though that’s the only question that matters, and every other aspect of the extravagantly energy-squandering lifestyle of today’s rich ought to be tacitly exempted from any hint of criticism. Of course that’s exactly the point of the exercise, and that’s what got me thinking about Friar Tetzel. Friar Tetzel? He’s a fine example of a historical phenomenon far from rare in the records, one of those utterly ordinary, undistinguished, inoffensive figures in whom the supreme absurdities of an era finally become impossible to ignore. 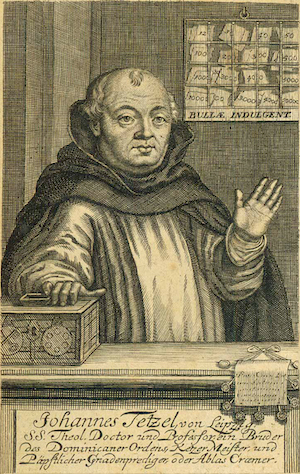 Johann Tetzel, OP, was a seller of indulgences in early 16th-century Germany: his business, that is, was to collect donations for the Roman Catholic church, in exchange for which dead family members or friends of the donors were promised time off from Purgatory. “For every coin that in my little box rings, another soul from Purgatory springs:” that, freely translated from the German, was his sales pitch, and he had no shortage of customers as he roamed through Germany, scooping up cash and pardoning mortal sins right and left. The only difficulty with his business model is that for a great many devout Germans, Tetzel’s jovial way of monetizing the church’s promise of salvation was the final straw; Jesus had driven the moneychangers from the Temple, sour jokes suggested, and the moneychangers had finally gotten around to returning the favor. Friar Tetzel was in no way solely responsible for the storm of the Protestant Reformation that broke over Germany in the mid-16th century and spread from there -- plenty of forces drove the crisis that shattered Western Christendom -- but his antics played a noticeable role in stripping the Roman Catholic church of what remained of its ancient dignity and exposing certain of its bad habits in a way many people could never again ignore. Diets are our modern equivalent of Friar Tetzel’s indulgences, the token gesture that takes the place of an authentic engagement with the realities of our lives and the chasms that gape between the things we claim to believe and the habits we unthinkingly follow. In today’s society, you can put tens of thousands of miles of jet travel each year on your frequent flyer account, run casual errands in a SUV that gets fewer miles per gallon than the average monster truck, dine on the latest fashionably exotic foods flown in from the other side of the planet, and generally have a carbon footprint larger than the entire population of a midsized Mexican town, but so long as you refuse to eat meat and parade that fact in front of your friends, you can claim to be one of the Good People, saving the planet one overpriced serving of wasabi tofu at a time. There’s nothing especially new about this. Diets have been a principal means of virtue signaling for a very long time. It’s only fair to say that I also know people who eat a vegan diet who don’t go around waving their personal dietary choices at all and sundry as an instrument of moral one-upmanship, and who wince when they see others do so. One of the few things that’s new is that wealthy faux-environmentalists who engage in this sort of irrelevant virtue signaling are finally being called on it. The timing’s no surprise, mind you. Back when the Right considered it mandatory to brandish a simulacrum of Christian virtue for political advantage, the hypocrisy scales were just as heavily loaded on their side of the aisle as on the Left’s, and so nobody on either side risked upsetting the applecart by pointing out whose walk had particularly little to do with their talk. It so happens, though, that a fair number of today’s insurgent populists don’t share that tendency to say one thing and do another; they have their share of ethical problems, certainly, but by and large they have a really quite refreshing habit of being upfront about their lapses -- and the inevitable result is that, to them, the environmental posturing of the privileged is the very model of a target-rich environment. Yet there’s something else going on that reveals, I think, far more than meets a casual glance, and that’s an intriguing reaction that critics of environmental hypocrisy have fielded. Ahem. In the post just mentioned, I noted that the fact that so few environmentalists these days actually walk their talk, and accept in their own lives the sharp restrictions on carbon use they insist should be imposed on everybody, explains why their pleas fall on so many deaf ears. “You must be the change you want to see in the world,” Gandhi famously said, and of course he’s right: it’s one of the inescapable rules of effective leadership that those who don’t lead by example, don’t actually lead at all. This is far from the first time I’ve pointed this out, and I’m far from the first person to mention what is, after all, a fairly obvious and straightforward point. One of my readers, though, was having none of this. She insisted with quite some heat that by pointing out the impressive hypocrisy of Stordalen and her ilk, and noting that the hypocrisy in question is a huge problem for climate change activism, I was just making excuses for people who don’t want to take climate change seriously, and she was sick of it. This is also far from the first time I’ve encountered this sort of response. Still, I’ve been turning over that comment of hers in my mind ever since, and it seems to me that it leads by tolerably straight paths down to one of the deep and unnoticed roots of the great predicament of our age. Let’s start with some basics. My comments presuppose that the debate over anthropogenic climate change takes place in something approximating a free marketplace of ideas, a setting in which participants are free to make a case for their beliefs to anyone who’s interested, and to convince anyone they can. That’s anything but a new concept, of course; the idea of the free marketplace of ideas is central to the entire logic of democracy, and it’s just as central to the logic of science -- at the heart of the social process of fact-finding we call science is the publication of experimental results, so that any educated person can see which hypotheses have proven themselves by surviving the onslaught of data. It’s not just beliefs that enter into the marketplace of ideas, though. People also participate in it, and they do so in terms of a certain necessary equality. As a participant in the marketplace of ideas, you’re free to try to convince others that your education, your experiences, and your hard work make you better informed about a given subject than most; you’re also free to try to convince others that your character is such that people should give you the benefit of the doubt. You cannot demand that anyone else has to accept these claims of yours. If you make a claim and other people refuse to believe what you’re saying, what’s more, you need to face the possibility that it’s not on them; you may well have failed to make an adequate case for the truth of your beliefs or the integrity of your character. This, in turn, is what my reader was implicitly rejecting. I said, in effect, “Here are some of the reasons why people question the integrity of climate change activists, and therefore the truth of their claims.” My reader’s response was to dismiss these serious questions about integrity as mere excuses for not doing what she insists people ought to do. Notice the underlying logic here: my reader apparently thinks she has no responsibility to convince anyone else of the rightness of her views, and that others have no right to an opinion that differs from hers. To be fair, this sort of thinking has appeared in far more extreme forms in our recent political culture. I’m thinking here, among other things, of those supporters of Hillary Clinton’s 2016 presidential campaign who insisted loudly that anyone who opposed Clinton could only have been motivated by sexism, since there could not have been any other possible reason for voting for anyone else. After Trump’s victory, in turn, a great many people on the losing side insisted in similarly absolute language that everyone who voted for Trump was a racist, and only voted for Trump because of their racism -- no other reasons could possibly exist. Neither of these claims are even remotely close to the truth. A few minutes of conversation with supporters of Bernie Sanders, on the one hand, or the great many Americans who held their nose and voted for Trump on the other, would have showed the people who made these claims that they were quite mistaken. What’s more, quite a few writers -- I was one of them -- who talked at length with people who voted for Trump, and had some sense of the concerns they brought to the polling booth, tried to explain those concerns. One and all, we got shouted down. I’m far from the only person who commented on the sheer delusional bizarrerie of that reaction. If you want to know why someone did something, it’s normally a good idea to ask them, and at least consider the possibility that they might be telling the truth. Given that the upper midwestern states that went for Trump and gave him the presidency were the same upper midwestern states that went for Barack Obama in 2008 and gave him the presidency, it’s a little surreal to insist that racism, and racism alone, explained those states’ 2016 voting record. Yet that insistence has been repeated in a rising spiral of shrill indignation ever since. Note the same logic here that was on display in my reader’s outburst. Those who voted against Hillary Clinton and for Donald Trump, according to the people just mentioned, don’t even have the right to have their own reasons for casting their votes. Their thoughts, their feelings, the complex lattices of human motivation that led them to vote as they did: those have been erased and replaced by a hateful and simplistic caricature. Imagine for a moment that I were to insist that the only reason anyone voted for Hillary Clinton is that they love war and hate peace. The people who voted for her would doubtless assail my assertion with furious rage -- and yet the reasoning is the same in both cases. Now of course part of what’s going on here is simple propaganda. It’s a lot easier, for example, to shriek abuse at people who voted against your candidate than it is to talk about the systematic destruction of the U.S. working class over the last forty years, say, or the way that free-trade policies and open borders have benefited the middle and upper middle classes at the expense of those further down the ladder. If you want to keep people from talking about issues like the ones I’ve just cited, what’s more, filling the air with shrieks of outrage is one way to go about it. Part of it, too, has to do with the tangled realities of social class in the United States. After all, when Madeline Albright, shilling for the Clinton campaign, insisted that “there’s a special place in Hell for women who don’t help other women,” she certainly didn’t mean to suggest that women in her very privileged class had any obligation to help women in the working classes, or even treat them with a minimum of basic human decency. (Those of my readers who’ve worked retail, as I have, already know that white women from the upper middle and upper classes are more likely to abuse those they consider beneath them than any other demographic in this country.) She meant, rather, that she expected women of the classes below hers to shut up, fall into line, and support Clinton’s ambitions, or else. There’s more going on here, though, than propaganda or class privilege. Neither of those issues, potent as they are, explains why the habits we’ve been discussing have remained fixed in place even though they’re so consistently self-defeating. If you want to convince people to vote for a presidential candidate, say, the first, utterly inescapable step is to find out why they don’t already want to vote for your candidate. The second, equally necessary step is to figure out what you can tell them that will change their minds. If you start instead by denouncing everyone who doesn’t already support your candidate, using the language of outraged moral superiority, and go on to insist that their objections to your candidate are just excuses and they should just shut up and do what they’re told, you know what? You’re going to lose. That should be obvious to anyone who can thread three consecutive thoughts about political strategy into a single sequence. That it’s not obvious at all, to those who are doing the shouting, shows that what’s going on here has very deep roots. What does it mean that so many people these days literally can’t conceive of the possibility that others can honestly disagree with them? What does it mean when they respond with furious rage to the suggestion that others might have their own reasons for making decisions, which are not the reasons they choose to assign to them? What it means is that a great many people in today’s industrial societies have lost track of the fact that others are subjects as well as objects: people, that is, and not just dolls to be posed or thrown aside as the mood strikes them. What’s more, this same weird distortion of consciousness affects not only relationships with other people but also their relationships with nature and with the basic conditions of existence. They roam a wilderness of mirrors, unable to see anything but their own reflections in the endlessly shifting corridors of silvered glass. We’ll talk more about that in two weeks, and in other essays to come. 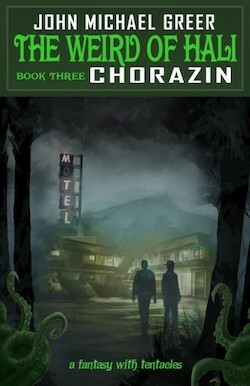 The Weird of Hali: Chorazin will be released Feb. 20, and can be pre-ordered here. The two previous books in the series can be ordered in paperback or ebook formats here and here.